Need a make-ahead appetizer for your next get-together? 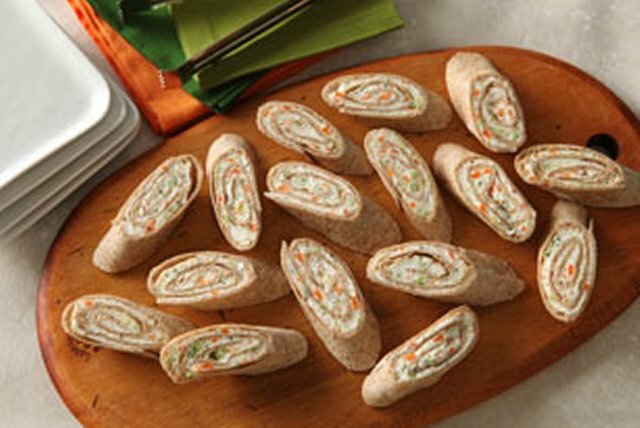 Rolled up with chopped carrots and broccoli, these cream cheese tortilla roll-ups make perfect little appetizers - all in one awesome bite. Mix cream cheese spread and dressing in medium bowl until blended. Stir in vegetables. Spread onto tortillas; roll up tightly. Wrap individually in plastic wrap. Refrigerate 1 hour. Unwrap roll-ups; trim and discard ends. Cut each roll-up into 6 diagonal slices. For a change of pace, try making these roll-ups with Philadelphia Garden Vegetable Light Cream Cheese Spread or Philadelphia Herb & Garlic Light Cream Cheese Spread. These easy-to-make roll-ups can be part of a healthy eating plan.